….Aunt Becky used to drive all of us to Christian Youth Fellowship in the early 50’s..
….describe the Sunday ‘Dinner’ with Becky and Connie as one of the last “home cooked” Sunday ‘Dinners’ left in Oconee County. 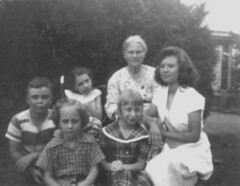 My mother and father were one of many children and I am one of eight siblings. Therefore, I have many, many cousins and kin. I also had a lot of Uncles and Aunts though many of them have passed on. We were close to most of them and love them all. There have been some folks special in my life and that of my family and Union Christian Church Circles. My Aunt Becky, now 85, and Cousin Connie Barnette, now 63, are special. They still live on the “Daniell-Dawson Farm” at 1761 Cliff Dawson Road, Watkinsville, where they have lived most of their lives. Aunt Becky is Senor Rebecca Dawson Barnette, born June 17, 1919. She is a sister of my father, Rayford T. Dawson, and third daughter of Cliff and Hassie Dawson. Like her siblings she was born in the Home House on Cliff Dawson Road and lived there until her marriage. She married Milton Barnette in 1939 and they had a daughter, Connie Barnette, born on August 17, 1941. Connie & Mama Hassie at Dawson Homeplace ca 1950. Early on, they learned that Connie sustained some brain damage at birth. She was a large infant born at home with only a mid-wife attending. She suffered from palsy and could not walk or talk from birth. Her parents enrolled her in special schools of the forties and fifties. She had special chairs and braces and was always included in family events. Connie cannot talk but has managed to communicate with her mother and me and others by sounds and head movements over the years. She is very bright and has a keen memory. She constantly reminds her mother and the rest of us of something we are forgetting. On December 26, 1950, Milton died suddenly with a heart attack leaving Becky a widow at age 32 and with Connie to raise on her own. For several years, Aunt Becky worked at Kress in Athens to supplement her income. Social Security benefits were limited in those days. They have always been faithful members of Union Christian Church, our family church, on Union Church Road in Watkinsville. Milton is buried in the cemetery there along with Mama Hassie and Daddy Cliff and many other Dawson relatives. Over the years, Becky has been faithful in tending the grave sites of family members always making sure there were fresh flowers on all special occasions. Aunt Becky lived with and cared for my Grandmother until her death in March of 1955. After that, Uncle Josiah Daniell, Mama Hassie’s brother, (a/k/a Boss Joe from being a prison guard). He was unmarried without children. He was a veteran of W W I that experienced much combat in France during some of the worst fighting. He was awarded the Distinguished Service Cross for bravery during combat and at least one purple heart. When Boss Joe died in February 1957, some of us boys started spending the night at Aunt Becky’s to help with Connie. As young persons, all of us Dawson kids attended Union Christian Church. Aunt Becky used to drive all of us to Christian Youth Fellowship in the early 50’s. That is where much of my early religious and social experiences took place. I frequently think of the lessons learned at that little church. I can think of several persons who would sing old favorites in a loud way. When the Roll is Called up Yonder and What a Friend We Have in Jesus are two of my all time favorite hymns from those childhood years at Union. Many relatives have passed on. Many ministers and longtime members have come and gone at Union Church over the decades. However, a constant is Connie and Becky who attend every function when health and weather permits. For about 20 years, Connie and Becky ran Dawson’s Store at Butler’s crossing during the day while my father, Rayford Dawson, was farming, driving a school bus and many other pursuits. Many people thought Aunt Becky was our mother and call her “Mrs. Dawson”. She is too kind and gentle to correct them. She just appreciates the memories. Years ago, we helped Aunt Becky buy a van with a lift. Later, a lift was needed in the bedroom and special chairs. Through it all, they both keep the faith and keep going. For several years, hired care givers have been spending the night with them to help with Connie. Some of the family members help during the day with bathroom and other lifting needs. Through it all, they greet you with a smile. They consider themselves as just “normal plain folks”. Many folks have commented over the years about how faithful Aunt Becky has been to Church, family and especially Connie. Many times I have heard, “…she will have many stars in her crown…”. A number of relatives, friends and fellow church members have helped them go to church, funerals, viewings, hospitals and civic affairs. They have attended countless family reunions, Christmas and Birthday parties and dinners and many special occasions. Yes, Connie and Aunt Becky were there for me on Election night and saw me sworn in as Commission Chair in December 1988 in the upstairs courtroom. Connie was a major motivation for me wanting and working toward an elevator in the Courthouse when it was enlarged and renovated in the late 90’s. I just did not think it was right that she and others had to be manually lifted up steps to enter the county courtroom. Connie has been to the Civic Center, Stadiums, graduations and all special occasions over the years. Many folks know them as Becky and Connie. Many of us know her as “Aunt Becky”. Everyone in the Dawson and Union Church Extended families has given pictures to Aunt Becky over the years. They have accumulated by the hundreds over the years. Some are stacked on top of each other but many are on display in their living room. I have told a number of friends that a picture of us is not official until one is given to and displayed by Aunt Becky. Connie, Becky, Bert & Sue Nell at Bert's 80th Birthday Celebration in Lexington, KY, in June 2003. These three sisters are the last survivors of the five Dawson Sisters. Aunt Becky loves all of her kin folks. Some she does not see as often. However, she keeps up with everyone by phone, cards and visits. She and Connie receive many notes and cards. They are loved and treasured by a literal army of folks. For the last three years, Earl Elsner, a widower and friend at Union, has come on Sunday morning and helped Connie into the van and driven them to and from church. They insisted on his eating Sunday “Dinner” with them. About a year and a half ago, Betty and I (and Jennifer when she is home) were “roped into” Sunday Dinner by Connie. She is a strong and persistent person. As we finish the meal each Sunday, she starts getting commitment from everyone about “next Sunday”. I describe the Sunday Dinner with Becky and Connie as one of the last “home cooked” Sunday Dinners left in Oconee County. I have eaten many a meal at that table over the decades. We enjoy the food and fellowship. Note: Aunt Becky Uses China & Glasses Every Sunday. In an effort to cut down on her work, we encouraged her to use "plastic" and she did one weekend. That was the weekend we took this picture which, to Aunt Becky, is embarrassing. My life and that of many others has been greatly enriched because of my relationship and involvement with “Aunt Becky” and Connie. They have been an inspiration and blessing to me and countless others. They have been an integral part of my life. May God Bless them and all the friends and relatives who have helped them over the years.